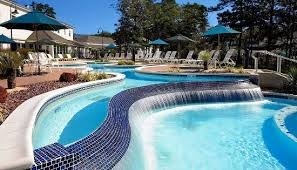 Once a staple for A-listers decades before there was an A-List, Seaview was the most fashionable resort and golf club on the eastern seaboard, the quintessential see-and-be-seen spot for the well heeled from the New York-Philadelphia metropolitan areas. It even hosted Princess Grace’s 16th birthday party in the day. Today, Seaview retains its old-world charm and an extraordinary commitment to service that is often overlooked at the glass and brass casinos nearby. 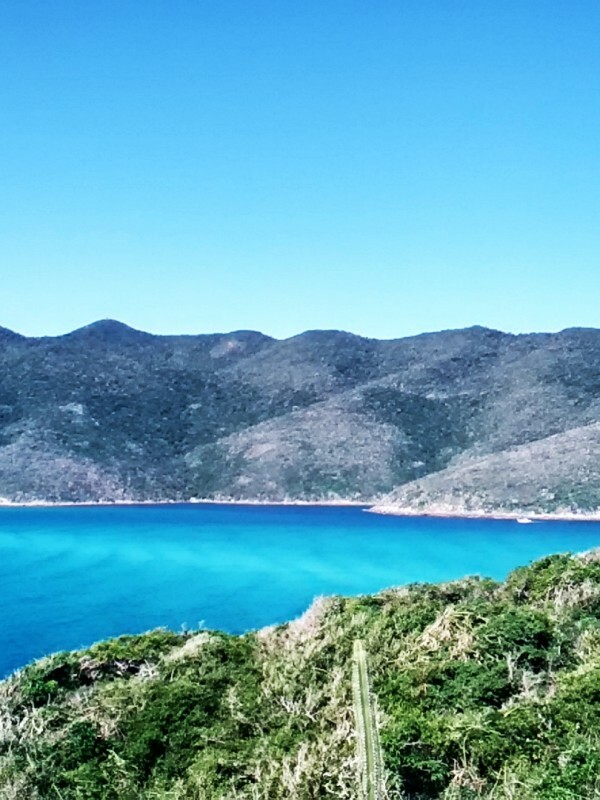 The resort is close enough to see the sea, but far enough away to relax in serene woodlands along Reed’s Bay. Famous for 36 holes of championship golf on two of New Jersey’s oldest and most prestigious courses, Seaview now boasts a pristine and intimately proportioned Elizabeth Arden Red Door Spa to entice the Golf and Spa set. This little treasure is tucked away at the far end of the estate near the newer and more upscale Marriott Vacation Club villas. On the day of my appointment, the resort ordered up a golf cart to whisk me to the spa where the world’s most efficient spa attendant guided me through the facilities and explained the layout and timing of my treatment. I floated aimlessly in the outdoor infinity pool and enjoyed a quick dip in the indoor Jacuzzi and cold plunge pool before heading to the relaxation room. Given I’m not a fan of extractions and my partner and I were pressed for time, I opted for Time Saver Facial to savour what I could of the legendary Elizabeth Arden face care regime, and I wasn’t disappointed. My technician, Rosemary, greeted me in the relaxation area, and led me down a dimly lit corridor to a warm cocoon-like treatment room. Facials at the spa are not just about the face, but are holistic relaxation practices, so I was asked to stretch out on a contoured massage bed with just the right incline and curvature for a perfectly relaxing fit. Rosemary laid a soothing heating pad across my abdomen and I felt the weight of the world drift from my body, a blissful bonus I hadn’t counted on as part of the facial. She explained that there would be no extractions with the Time Saver treatment, but shone a light on my skin and gave it the same care and attention I imagine any facial specialist would before selecting the right products for my combination skin. She applied the Calming Gel Cleanser from the new Red Door Spa Professional line (available exclusively at Elizabeth Arden Red Door Spas) and applied warm compresses to loosen surface dirt and prepare my skin for exfoliation. Next up was the Cranberry Enzyme Exfoliator from the same new line. The smell and feel of it on my skin was fresh and invigorating. Rosemary worked and awakened my skin with gentle, hypnotic strokes before polishing off my complexion with Prevage Anti-Aging Daily Serum and Eye Serum, both of which felt light and velvety. Honestly? I didn’t want to leave, but I did want to show off my glowing skin to the world and explore the nooks and crannies of the spa facilities. I loved the old-world vibe of this place. Just down the road from there is the historic town of Smithville, home to tiny trinket shops, bakeries and the Smithville Inn, where we had a delicious dinner, followed by a nice relaxing stroll around the lake in the evening. Neither of us felt like leaving, but the call of Atlantic City was too hard to resist. 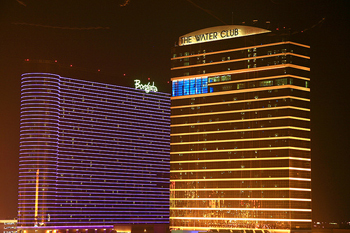 I am a fan of the Borgata Casino having visited it twice before on spontaneous day trips while in the NYC area. This however was the first time we stayed overnight to enjoy all it has to offer. First stop, the hotel room, which was stylish and spacious with classic Italian decor. The pièce de résistance is the bathroom — marble walls and floor, granite countertop, and an oversized, glass-enclosed shower big enough for two. We loved it. The next day I had to choose between two terrific spas onsite, Spa Toccare located on the 3rd floor of the Borgata and The Immersion Spa which is on the 34th floor of The Water Club, a separate and slightly more upscale accommodation that shares the same footprint as the Borgata, but has a distinctly different, diaphanous feel to it. This is where the cognoscenti stay to get some distance from effervescent gambling scene. I opted for the Immersion Spa for two particular reasons: 1) the view and 2) the Ayurveda experiences on offer. Having spent the early part of the day on the boardwalk in AC taking in the Pier Shops and eating possibly the world’s best onion rings at Pickles Deli at Bally’s, I was ready for a little quiet contemplation. The Immersion Spa was just the place. I arrived early so that I could unwind and take a swim in the lovely, long lap pool. 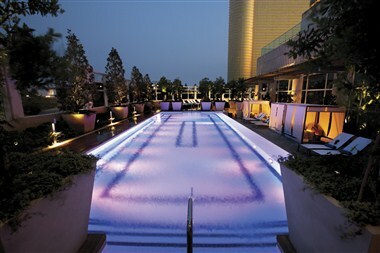 The spa itself is serene and spotless, with a modern American Zen vibe and views to die for. In the women’s only area, there is a changing room, showers and a vanity area that includes all the thoughtful amenities a woman could want and then some including blow dryers, curling irons, hairspray, moisturisers, even tiny combs in case you forgot your own. The ‘wet area’ features a steam room, cold plunge pool and a powerful jet-streamed Jacuzzi with views of the bay on one side and the ocean on the other. I sighed peacefully as the bright white sunlight turn golden, then pale, warm amber — both of us sinking deeply into the peace of the evening. Until of course, the spa attendant came calling for me when I wasn’t in the relaxation room for the start of my treatment. I rushed out, having lost track of time, but was greeted with a near nirvana-like calmness by Chris, my male therapist who was going to give me the Abyanga Massage. Abhyanga is an Ayurveda oil massage that uses gentle, rhythmic massage strokes to increase circulation, calm the nerves and energize the mind and body. When I signed in to the spa, I had to fill out a form that Chris then used to determine my dosha and select the right oil for my dosha type. Whether it was the size of his hands, the expert pressure he applied, or the distinctly different, lengthening style of strokes used for this particular massage, I had possibly the best massage I have ever experienced. My skin soaked up the oil like a ravenous child. Every muscle felt honoured and attended to. By the time the massage ended, I felt both my body and soul nourished. Weeks later, I find myself still day-dreaming about it. My only disappointment was that the spa store did not stock the oil that was used so I could bring little piece of the experience home with me. We returned to the Borgata and had a scrumptious dinner at the Old Homestead and had so much fun all around that we decided to stay an extra night, dancing and gambling the night away. The last on my list of spas to visit in and around the Atlantic City area was the Bask Spa at the newest game in town, the Revel. Driving further north from central AC, however, is a dreary experience, and one could be forgiven for the second thoughts that pop into your head as you drive towards the Revel. Once inside however it is easy to forget that anything else exists anywhere else. 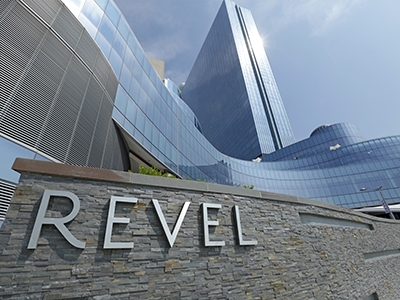 The Revel is an opulent world onto itself, a mega entertainment complex that bills itself as a resort playground for immersive lifestyle experiences. Contemporary, elegant and exclusive when it counts, this beachfront casino pulsates with raw power, pulling day into night and merging inside with out. The hotel lobby sits114 feet above sea level and stretches across two acres of outdoor space. Its centerpiece is the stunning InOut Pool that begins indoors and continues outside, surrounded by loungers that lap up the shimmering ocean view. “Before experiencing our services and utilizing our facilities, we require that you sign this Release of Liability. I won’t bore you with the next few minutes. The staff was polite and responsive and I received a refund for my treatment because I simply could not sign the waiver. It was hugely disappointing to have driven there and back for nothing. Maybe no one else cares about these waivers but me…or maybe they do. Hard to know. But having researched it since, these waivers are quite normal in health clubs across America, and while they don’t always stand up in a court of law, the practice is in place to protect the spa, not you as the client, and that makes me uncomfortable. The potential business that a spa could lose from clients who won’t sign a waiver like this may well exceed the gain from insulating their business from liability for accidents or mistakes. And that doesn’t benefit anyone. At the end of the day, it is a personal decision for each spa goer. Sadly for me, the oohs and aaaahs from people coming out of Bask made me terribly disappointed to have to choose.